For the past few weeks I’ve been following an online Sketchbook Skool course called Polishing. It’s a useful way to pull yourself out of your comfort zone. 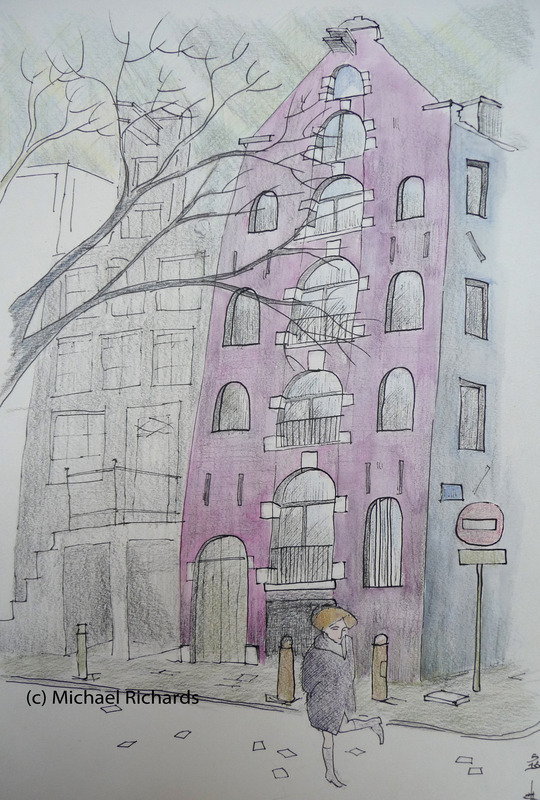 The exercise for the second week was an urban sketching project with Dutch illustrator, Koosje Koene. At the time I was in Germany where it was raining steadily and I didn’t really feel like venturing out. In an old album I found an image of a house on an Amsterdam canal that was actually four small photographs pasted together to produce a strangely disorienting perspective. I took the original photographs one Saturday afternoon in winter on the Keizersgracht in Amsterdam. I’d always intended to draw the building and retain the stretched perspective so, more than thirty years later, here it is. It captures a moment when my then girlfriend – later my wife, later still my ex-wife – put her foot in something rather unwelcome. In those days it was risky not looking where you were putting your feet in Amsterdam. One of the many things I enjoyed about living in Germany was the way seasons are celebrated: Christmas markets are well-known, but there are festivals built around the first applewine pressing, the start of spring, young wine and many others. I can never think of Germany in October without remembering the baskets of gourds that appear at many farm gates, at least in southern Germany where I was earlier this week. At three or four for a Euro, there’s no excuse not to decorate the kitchen table with an autumnal pile of gourds, turning leaves and lichen-covered branches. Some things beg to be illustrated. 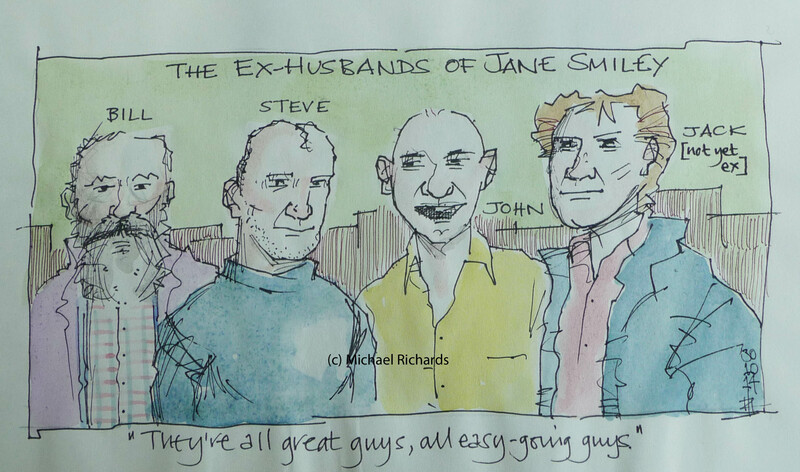 When Robert McCrum interviewed the lovely Jane Smiley for the Observer newspaper last year, and she described her current and three ex-husbands as “all great guys, all easy-going guys, and I’m fond of all of them” this picture of them all lined up for a group photograph sprung into my head. In the article there was a picture of Jack but not of the other three, so I had to imagine what they might be like. I wish in retrospect that I’d spent more time on the drawing, but it was a spontaneous reaction so I left it as it is. I wish, too, that I hadn’t made John look like a bit like Amazon’s Jeff Bezos – I’m sure he doesn’t deserve that. A kooikerhondje is a Dutch spaniel, originally bred to lure ducks into traps. In addition to their attractive colouring they have dark strands in their ears known as ear-rings. 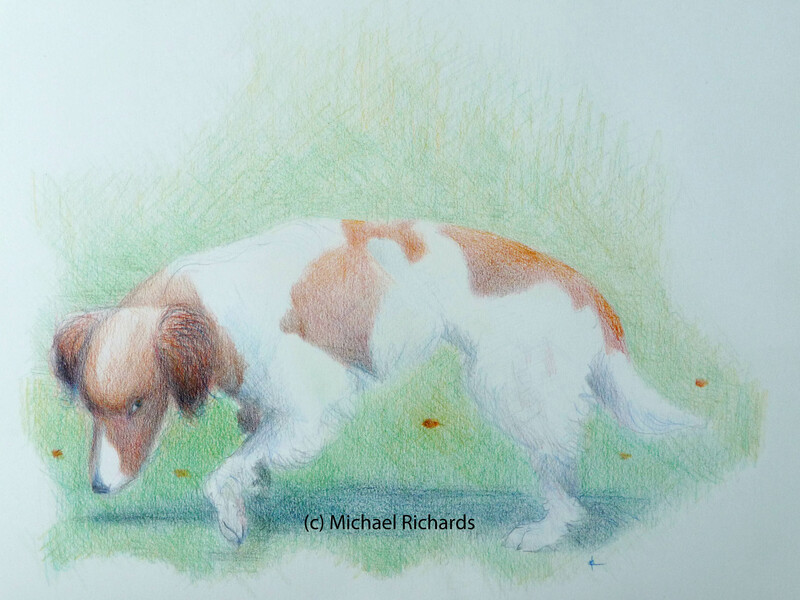 This drawing is based on a photograph sent to me by a friend who is lucky enough to own one of these splendid dogs. 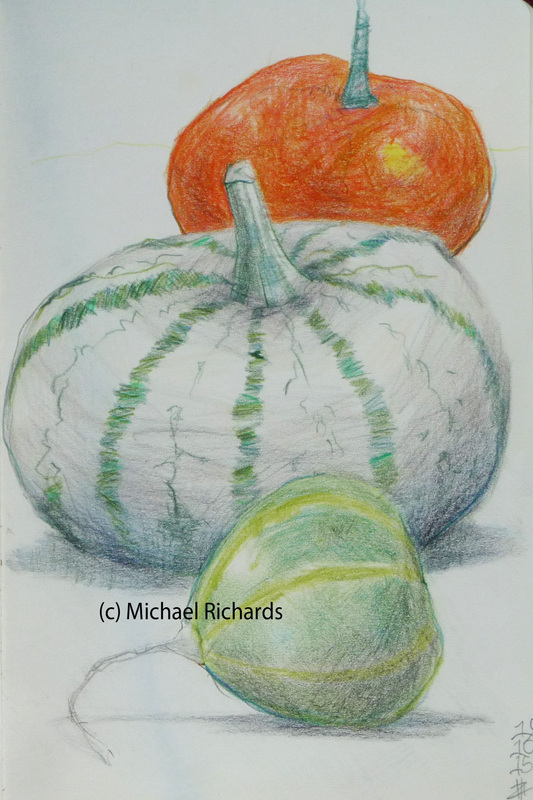 As before, the subject dictated the medium: the soft fur and delicate colouring suggested coloured pencils. Artists such as Tom Homewood can do wonderfully free paintings of dogs but at the moment that’s a little out of my reach. Unfortunately to get any sort of image you could actually see I’ve had to beef up the contrast a bit here. There is more subtlety – I promise – in the original. In 2009 the Book Depository ran a bookmark competition and I’m pleased to say I was one of the winners – not with this one though. Although it referenced books and used the bookmark shape to good advantage, I wonder now why I ever thought it had a chance of winning. Imagine the reaction of some poor child, opening her copy of the Gruffalo and finding this tucked inside. 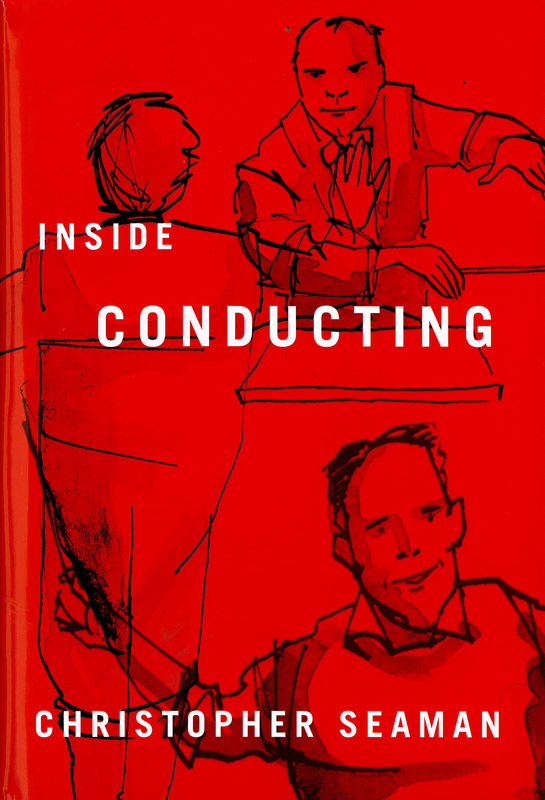 You’ll be pleased to know that it wasn’t drawn from life: I followed Edward Ardizzone’s advice and drew it wholly from the imagination as an illustrator should, according to him. My winning drawing showed an old man sitting on a riverbank reading a book and fishing with a line strung from his toe. Much more tasteful.